Falcon Northwest is mostly known for massive gaming systems, like the Mach V. The company has dabbled with smaller systems, such as the micro ATX-based Fragbox, but that machine tends to take up more floor space than most full-tower PCs thanks to its box-like shape. Enter the Tiki. Models like the Tiki, and last year’s Alienware X51, defy categories. 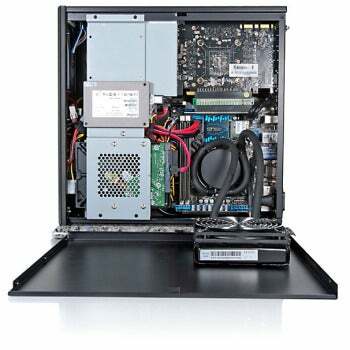 They include higher-end components inside cases that look comfortable in executive offices. The Tiki one-ups the X51 by including speedier graphics card options, even the Nvidia GTX 680, one of the fastest single GPU graphics cards available. The Tiki that Falcon Northwest shipped to us included a 256GB solid-state drive (SSD), a 2TB hard drive, and a GTX 680. The system burns through most game titles, particularly on mainstream 1080p or 1920-by-1200-pixel displays. All that performance comes at a cost, however. Our fully loaded Tiki weighs in at almost $2800. That’s about $400 more than the V3 Convoy, which ships with a pair of GTX 670 GPUs and the same Core i7-3770K. 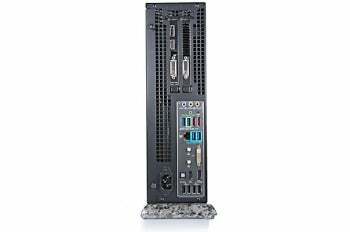 Entry-level configurations of the Tiki, with a standard hard drive, a GTX 560 GPU, and an Intel Core i5-3450, start at $1827. On the other hand, the Tiki is a much slicker, custom package. And then there’s the granite base. Yes, each Tiki ships with a granite base, either gray or black. That base serves a purpose, anchoring the thin monolith to the ground so you don’t accidentally tip it over with an errant knee. And the polished granite lends the tower a bit of élan that a simple weighted base would lack. The Tiki is also completely self-contained, despite being roughly the same size as the Alienware X51. The X51 required an external power brick, but the Tiki includes a 450W, 80-plus bronze certified power supply. During game testing, the Tiki idled at just 58W. Even under full gaming load, pushing the 4.3GHz overclocked Core i7-3770K and GTX 680 all out, the overall power consumption was only 231W. The system generated a score of 177 on PCWorld’s WorldBench 7 benchmark suite, which is respectable for a system with this CPU in a compact system. Game benchmarks at 1920-by-1200-pixel resolution, with 4x antialiasing enabled, certainly impressed. Crysis 2 ran at 62 fps; Batman: Arkham Asylum, at 94 fps; and DiRT3, at 105 fps. Even so, you may need to dial back detail levels on some games. The highly demanding Metro 2033 ran at 28 fps, while the more recent DiRT Showdown eked out 33 fps. It’s still pretty remarkable performance for a system built into a chassis just 4 inches by 13.25 inches by 13.5 inches. Connectivity includes one gigabit ethernet jack, 802.11 Wi-Fi (with dual antenna connections), and Bluetooth 4.0. Falcon Northwest doesn’t include a standard keyboard and mouse, but it does offer an array of gaming keyboard and mouse options. The Tiki includes one 3.5-inch storage bay and two 2.5-inch storage slots. The optical drive is a low-profile, slot-load type commonly used in laptops. It’s mounted in an unusual location: on the top of the system, assuming you stand the Tiki on its granite base. So you drop the disk vertically into the slot. Falcon Northwest ships Cyberlink's PowerDVD 11 with its Blu-ray-equipped systems, which takes care of Blu-ray movie playback. Windows 7 Home Premium x64 edition is the standard operating system. Windows 7 Pro or Ultimate are added cost options, as are the several flavors of Microsoft Office. The small chassis precludes significant internal expansion, but it does have space for a second 2.5-inch storage device, and Falcon Northwest will happily sell you a pair of 512GB SSDs in that space—if you’re willing to pony up the cost. The CPU cooling fan is actually mounted into the case side, and is part of an Asetek sealed liquid CPU cooler. The net result is amazingly little noise, even under full load. Overall, the Tiki offers excellent performance for its size, is amazingly power efficient, and is nearly quiet running in your home office. It’s not inexpensive, but its performance and unobtrusive nature are sure to impress. The Tiki is a high end gaming PC in a slick, pint-sized chassis, offering excellent gaming performance, albeit at a price.